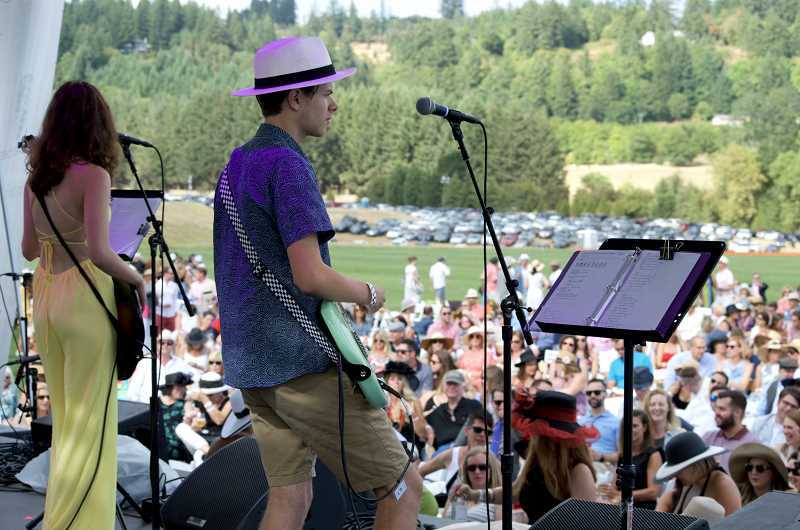 Backstage jitters morphed into exhilaration when the Youth Music Project (YMP) Intern Band took its place on stage at the Hidden Creek Polo Club in West Linn on Saturday for the third-annual Polo Noir. The band livened up the crowd by playing '80s classics, and the audience even screamed for an encore after the three 18-year-olds stood in the spotlight together one last time. "In the movies, when they're on stage and then they chant out the song to you, that was in real life. 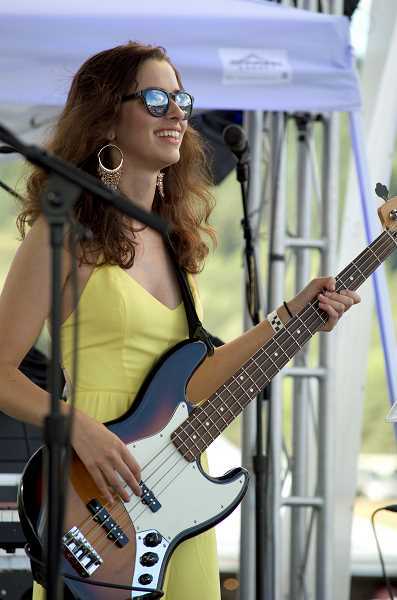 I felt like Hannah Montana," said Lauren Flick, the electric bass player and lead singer in the YMP Intern Band, referring to the fictional singer on television. "I feel really sentimental, like all this hard work has led up to this point. And they were an awesome crowd — super supportive. There's nothing worse than having a deadbeat crowd, and this venue's been incredible." The three bandmates were part of the Teen Internship Program at Youth Music Project, a nonprofit organization that provides music education to children. Local youth generally apply for the internship during their junior year and work at YMP for two years. Interns assist with music classes, co-run the monthly teen open mic night and have an option of joining the Intern Band that gets together weekly with an instructor. "The Intern Band is a moving group of kids that will come in and out of it," said Travis Magrane, executive director at YMP. "This trio has been playing together for a couple years. As they graduate, we have other folks coming in." The band had never before performed at Polo Noir, which draws hundreds of polo fans to an event that this year benefited the Children's Cancer Association and Harper's Playground, a nonprofit organization that builds inclusive playgrounds around the world. "When they asked us to do this huge profile event — this is the biggest thing we've done — it was pretty exciting," said Flick, a 2018 Wilsonville High School graduate. The other two musicians that make up the YMP Intern Band are Nick Boatman, who plays guitar and just graduated from Alliance Charter Academy in Oregon City, and Zac Cross, who plays drums and just graduated from La Salle Catholic College Preparatory in Milwaukie. Magrane said the flavor of the band changes based on their musical interests. The last band was more blues-oriented, while the current band tends to lean toward rock n' roll. 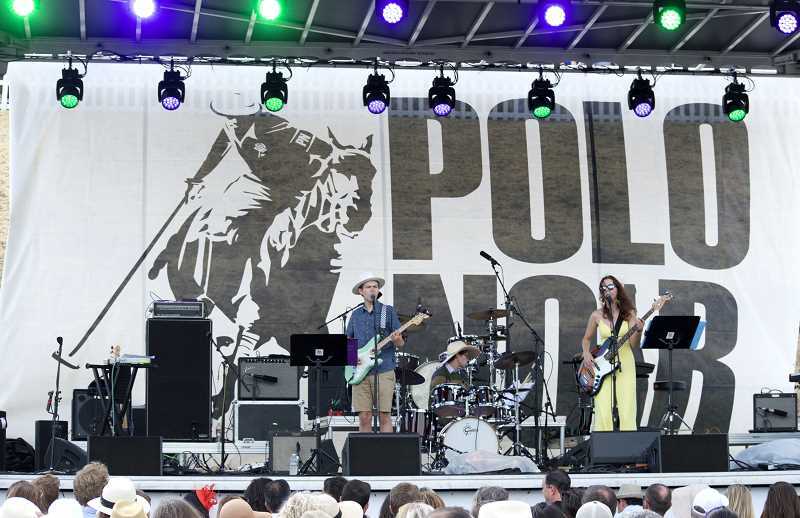 While the band is no stranger to monthly gigs, performing at the Polo Noir — and opening for The Head and The Heart — was the group's largest gig yet. During their opening performance, the group played '80s hits and classic-rock numbers like "Johnny B. Goode" by Chuck Berry, as well as hits by Elvis, The Beatles, Madonna and Billy Idol. "I think they did incredible and I'm not surprised. These kids are just incredible musicians," Magrane said. "It's so wonderful to see them blossom on this big stage here." Though the trio's time with YMP and the band has now come to a close, Flick said she credits the internship for helping her find her passion: teaching. "Music for me when I was younger was my way of escaping — I was homeschooled for a long time and music was the way for me to get out of the house in my head," said Flick. "To be able to pass that on to kids — I don't know their situation — and to be able to influence them in a positive way like that, it's incredible, so I'm studying education this fall." While she'll continue playing music as a hobby, hopefully forming her own all-girls band, Flick will be attending the University of Oregon in the fall to pursue a degree in education. Her goal is to become a math teacher — another favorite subject. "When I first started playing the bass ... I was insecure about it because I didn't really ever see a lot of women playing the bass in rock bands," said Flick. "So moving forward, since I'm studying mathematics, there's a lot of stereotypes and assumptions made about women in math. The confidence I've gained by playing the bass in band, I'm really going to take forward with me in college and be the best mathematician I can and not let my gender affect my performance." As for the future of the Intern Band, Magrane hopes students will be able to perform at Polo Noir annually. "I want them to stick around, but the cool thing is that everything they've learned at YMP, everything they taught us at YMP, now they get to go out into the world and spread that, so we couldn't be happier and more excited for them," Magrane said. "We'll have another Intern Band and the set will be a little different probably because there will be different kids, but we're sad to see them go but so excited for them."